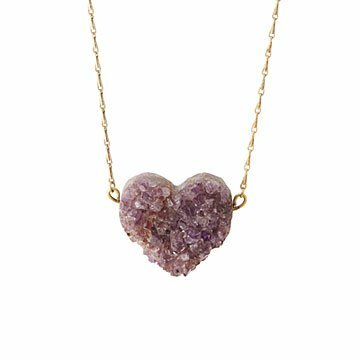 Emilie Shapiro's sparkling heart necklace is a gorgeous statement piece made of an actual, natural geode. All over the world, unassuming rocks are keeping mysterious secrets. Within their hard walls, they're growing something magical: gorgeous gems. Emilie Shapiro releases that magic by turning those "ordinary" stones into geode necklaces. Once the rock is open, a little wonderland of amethystin varying shadesand tiny glittering druzy crystals appears. By shaping the geode into a large heart and leaving the stone exterior exposed, Emilie creates a bold statement piece brimming with natural beauty. As a finishing touch, she attaches the sparkling heart to an elegant brass chain. Handmade in Long Island City, New York. Pendant: 1.8" L Chain: 18"